Diane W. Thomas, is the First Lady of Forestville New Redeemer Baptist Church (FNRBC) in Forestville, MD. She is to our congregation a rare breed as she provides the Youth Reflections to the youth each month, serves as President of the Sanctuary Choir, and once served as the Church Clerk from the inception of the church until 2006. First Lady Thomas is one who shares many of her talents and abilities by participating in many of the church activities for the women and youth. She does this for the purpose of the growth and development of the church. She is down to earth, witty and very comfortable to be around. She’s not high maintenance, but high in trusting in God and supporting the church with lots of love. 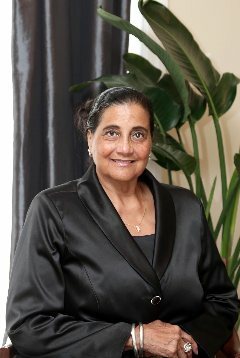 In 2005 after First Lady Thomas retired from the Baltimore public schools, she was asked to come out of retirement and become the principal of FNRBC's Children of Promise Christian Academy. She worked for several years without a salary to help offset the school’s finances. She performed double duty as a K4 teacher for two years at the school and tutored the students who had the need in English and writing. She would arrive early in the morning for school and await the last parent in the evening. Her dedication to the school was second to none as she gave her time to the before and aftercare program. First Lady Thomas attended DC public schools graduating from McKinley Tech High. She also graduated from Morgan State University with a Bachelors of Science degree and received her Masters degree in Early Childhood Education from UDC. She worked for the Baltimore public schools for 32 years, commuting from the District the entire time. She is a member of the Philanthropic Education Organization (PEO) DC chapter, an organization of over 250 thousand members. She is currently the president of the chapter and has served as Sergeant of Arms, Chaplin, recording secretary, and correspondence secretary. First Lady Thomas volunteered and mentored for Teachers for America. She instructed persons who were not educators on how to teach, and taught literacy to those who could not read. She is accredited to have enabled many persons to read and obtain employment. For more than 40 years she served as a counselor and/or director to the Resident Camps as well as the Day Camps in the District of Columbia under the Department of Recreation working with hundreds of children each summer. She also served as an instructor for "PAYOFF" (Parents And Youth On Family Functioning), another community group literacy program. She has been married to the Rev. Dr. Nathaniel B. Thomas, Pastor of FNRBC, for 43 years, and is the mother of three children and grandmother of four. She loves traveling and sports, and is adventurous, fun loving and very devoted and supportive to Pastor Thomas, their family and her mother-in-law, Deacon Estell Thomas.